The NC-400 nano coating dipping machine is an entry level dip coating system designed for processing nano coatings such as fluoropolymers. The fluoropolymer coatings are normally blended with high cost fluorinated solvents for safety, reduction in transport costs and the environment. However, these solvents are highly volatile and can be lost from the system. The nano coat system prevents these significant losses and allow coating of low and medium volume products in a safe, cost-effective way. Dip tank and basket system. 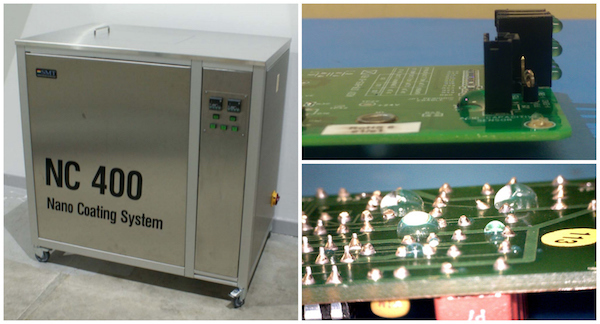 A dipping tank and basket system for easy submersion of the product for conformal coating. Refrigerated system. A refrigerated sump for control and capture of the nano coating and the fluorinated solvents. Filtration. Integrated pumping and filter system for control of the quality of the nano coating. Unique refrigeration. Unique solid state refrigeration system to reduce evaporation losses. Built in redundancy. The solid state system tolerates failure of part of the cooling array and can continue working, saving both lost production time and expensive coating materials. Manual or automated dipping. The dipping operation can be completed manually by the operator or optional automated dipping. Full compatibility. The NC-400 works with almost all current fluoro-polymer coating materials and fluorinated solvents from a variety of manufacturers. Height: 1075 mm (on braked castors). Weight: 228 kg excluding coating fluid. Work basket size: 400mm L x 250mm W x 200mm H.
Capacity of 3 – 3.5 litres per minute at 15 deg. C.
Filters: three stage system with progressive path through 5 um, 1 um and 0.1 um particle filtration. Filter type: low pressure, stainless steel, and alloy body with disposable filter cartridge. Water separation by dual system: condensing coil collection channel with direct drain off to water collection container 5 litres, plus tank inline separator with manual drain to the same 5 litre container. Cooling circuits: 3 circuits fitted. Circuit 1: Cool the tank fluid (this is the primary vapour control method). Circuits 2: Tank cooling coils above the dwell zone. Circuits 3: Tank cooling coils as additional freeboard coil fitted just under the access lid. Cooling system: Solid state Peltier multi-stage cascade type system with a combined cooling capacity of 3.12 Kw/ hour – 10645 BTU’s/ hour at full load. Estimated average hourly cooling load typically @ 1.3 Kw/ hour – 4435 BTU’s/ hour depending on ambient temperature and the bath loading. System is an aluminium structural extrusion machine construction system for the framework. Removable side and end panels constructed from 1.2mm 304L stainless steel. Top cover and tank from 1.5mm 316L stainless steel. All pipework, baffles, and filter housings are 304 or 316 stainless steel. Standard 220/230 50/60 Hz VAC. All data subject is modification at anytime up to order.